Research in the McGuire Lab seeks to connect four fundamental features of the evolution of organismal diversity: (1) lineage diversification, (2) historical biogeography, and the influence of (3) morphological and (4) molecular evolution on organismal performance. These studies primarily involve reptiles, amphibians, and hummingbirds. Although there are a number of approaches that one may utilize in order to gain insight into the process of lineage and adaptive diversification, our research is firmly rooted in phylogenetic systematics and population genetics, which serve as the foundation for the comparative analysis of physiological and organismal performance data. Our approach to studying lineage diversification generally involves applying a combination of phylogenetic/phylogenomic and population demographic analyses as we are interested not just in timing of branching relationships but also in the fate of lineages that have only recently diverged or have recently come back into secondary contact and may therefore be experiencing gene flow or full-blown merger. Our research is collections-based and we consequently perform extensive fieldwork in support of this research. Although Jim’s field program is currently focused on the Indonesian island of Sulawesi, his work in recent years has also taken him on multiple expeditions to Indonesia’s Lesser Sunda Islands, Sumatra, and the Mentawai Archipelago. Members of the lab have also conducted recent fieldwork in Indonesia’s Maluku and West Papua Provinces, México, in multiple African countries, and in Australia (as well as in the western United States). Current projects in the lab include (1) an NSF-funded Biodiversity Discovery and Analysis investigation of elevational diversification on mountains of Sulawesi (in collaboration with Rauri Bowie, Kevin Rowe, Karen Rowe, Rosemary Gillespie, Susan Perkins, Pete Oboyski, and a large team of Indonesian colleagues), (2) an NSF-funded study of adaptive diversification in Limnonectes fanged frogs of Sulawesi and the Philippines (in collaboration with Rafe Brown, Ben Evans, and Djoko Iskandar), (3) a comparative analysis of Sulawesi biogeography based on exome-capture data for Draco flying lizards, Cyrtodactylus bent-toed geckos, and Lamprolepis emerald skinks, as well as multilocus Sanger sequence data for Oreophryne, Rhacophorus, Sphenomorphus, and Tytthoscincus, and (4) a comparative study of Lesser Sundas biogeography using exome-capture data for Draco, Lamprolepis, Cyrtodactylus, Sphenomorphus, Limnonectes, and Fejervarya paddy frogs that was funded by a now-expired NSF award. We are about to kick off a new round of studies investigating convergent evolution of hummingbirds and sunbirds that will be supported by an NSF Dimensions of Biodiversity grant that was recently recommended for full funding. Additional details about these projects are presented below. The Indonesian island of Sulawesi is an outstanding target for biodiversity discovery and analysis. This research will inventory terrestrial vertebrates (amphibians, reptiles, birds and mammals), spiders, and vertebrate parasites of this huge tropical island. Field teams composed of specialists on each of these groups will survey 10 major mountains on Sulawesi over the course of five field seasons. By thoroughly sampling this island now while some forest remains and depositing these collections in natural history museums, the raw materials (specimens) supporting the study of tropical diversification will be made available to this and future generations of biological researchers. This project includes training of undergraduate and graduate students, postdocs, and technicians from US, Australian, Canadian, and Indonesian research institutions in biotic survey research. Senior Indonesian scientists will visit Berkeley for collaborative analysis of specimens and writing of manuscripts. The research team will lead two workshops in Indonesia primarily oriented around molecular genetic data collection and analysis, including high-throughput sequence data, and corresponding population genetic, phylogenetic, and biogeographical analysis. between 10 and 5 million years ago. The composite nature of the island has been strongly implicated in the process of in situ species diversification on Sulawesi. Field sites for biotic survey work were selected to allow thorough sampling of the four arms of Sulawesi as well as its Central Core. A major focus of the program will be sampling along elevational transects on the largest mountains of each Area of Endemism (AOE), thereby enabling transects that reach >2500 m in elevation. None of the focal taxa targeted here havebeen sampled adequately from high elevation sites. The scientific value of the proposed field efforts are considerable and fall broadly into the following themes: (1) documentation of biodiversity, including species and their distributions, evolutionary and population genetic relationships and affinities, and the chronology and geological context of species and community diversification, (2) climate change and conservation biology, including documentation of disease outbreak and response, invasive species, and extinction, and (3) understanding of interesting evolutionary processes, including adaptive radiation, hybridization, ecological opportunity, and the genetic basis of biological innovation. 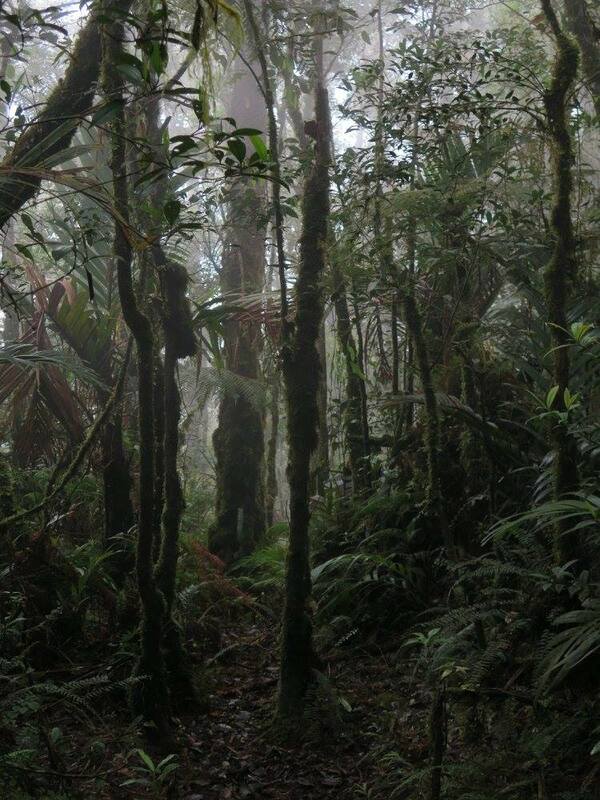 Images: (1) Gorgeous mossy forest at ~1800 m elevation on Gunung Latimojong in the southeast quadrant of Sulawesi’s Central Core. 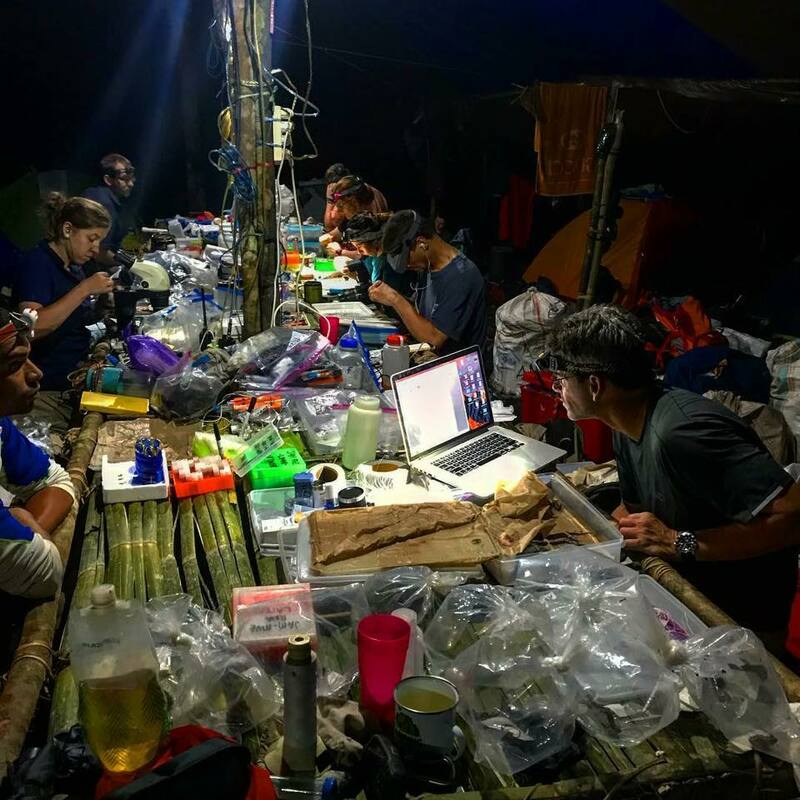 (2) Jim (in the foreground) and field crew in our 700 m elevation camp on Gunung Torompupu in the northwest quadrant of Sulawesi’s Central Core. 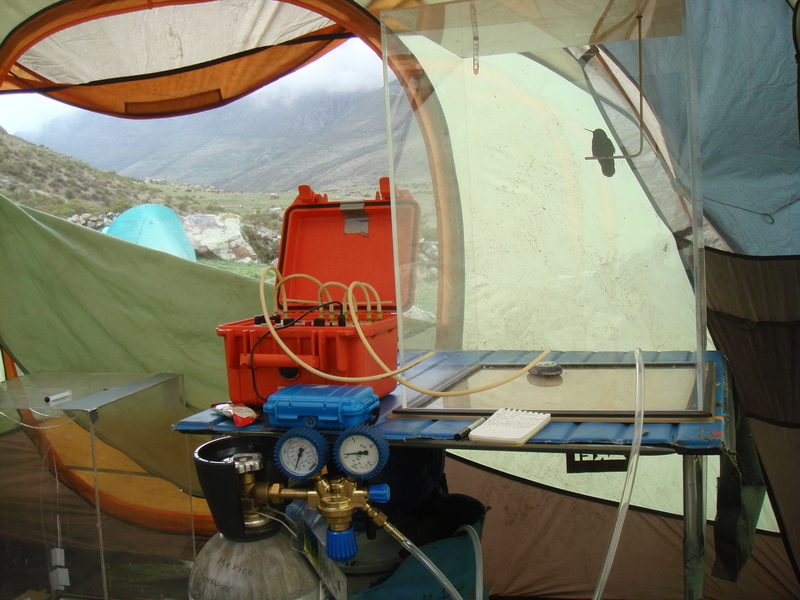 Its hard to believe but this “portable lab” is several hours hike from the nearest village/road. Photo taken by Alexander Stubbs. When a species reaches an unoccupied land area such as a newly formed island, there is an opportunity for that single colonizer to radiate into a large number of species that exploit the multitude of otherwise unoccupied niches. These so-called ‘adaptive radiations’ are of profound interest to evolutionary biologists because they often dramatically exemplify some of the more important features of the evolutionary process, including rapid diversification of species, the evolution of complex adaptive traits, and the mechanisms by which recently derived species avoid competition with one another as well as hybridization. Well-characterized adaptive radiations are relatively rare, and tend to be studied intensively by organismal biologists once they have become established as model systems for study. Examples of classical adaptive radiations include Darwin’s Finches, the Hawaiian Silversword alliance of plants, and the cichlid fish radiation endemic to the Rift Lakes of Africa. This project will characterize a newly discovered adaptive radiation involving Southeast Asian frogs, while allowing for a detailed study of biological diversification in an understudied region of the world. phylogenetic framework for this assemblage using an exome-capture Next-Generation Sequencing (NGS) approach. In the context of this phylogeny, it will then provide analyses of body size evolution, test for correlations between phenotypic traits (both morphological and physiological) with microhabitat specializations, describe in detail the species by species reproductive diversity exemplified by this group, and provide an analysis of vocalization behavioral diversity. 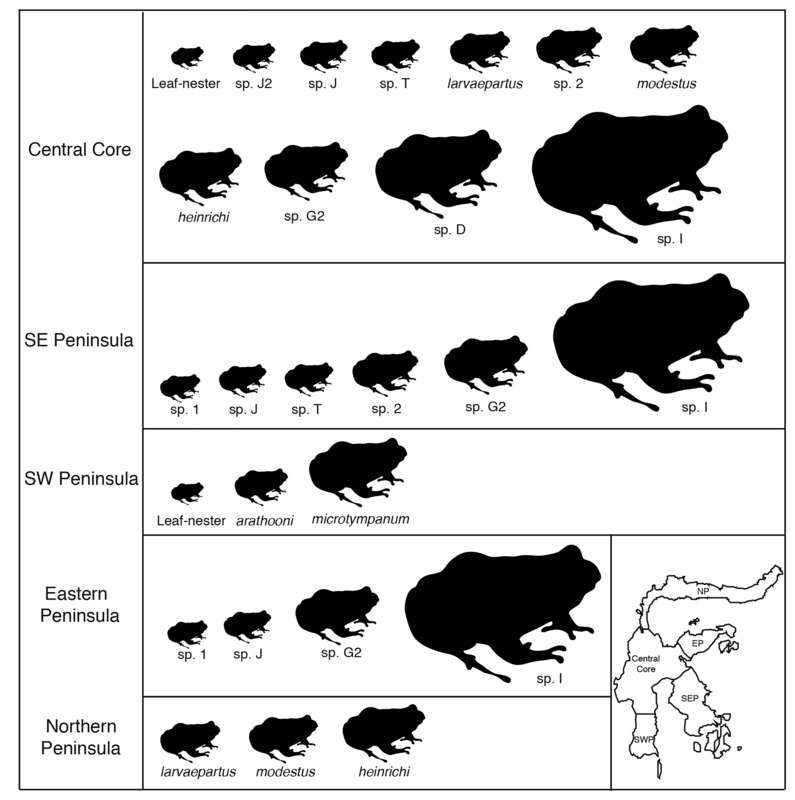 This research will be ground-breaking by fully characterizing ecological drivers of this radiation, as well as the morphological, physiological, and life history features associated with the assemblage’s remarkable diversification in insular Southeast Asia. Images: (1) Limnonectes fanged frogs on Sulawesi exhibit tremendous variation in body mass with many sympatric species. 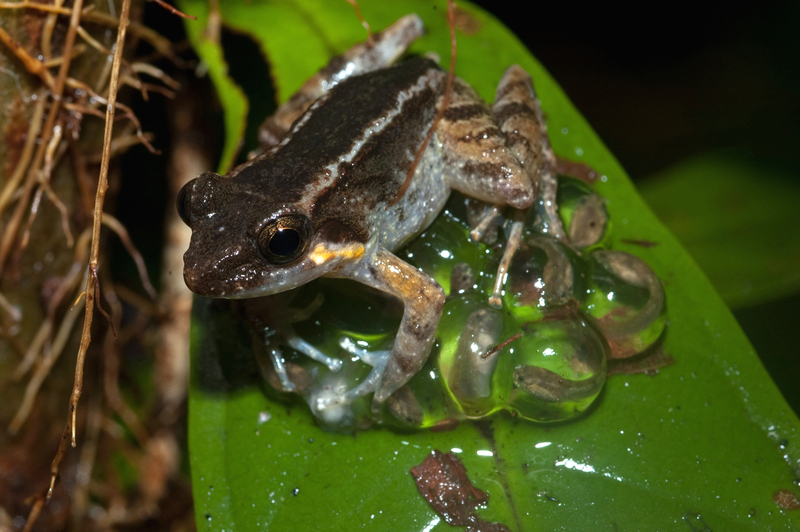 (2) Limnonectes “leaf-nester” – an undescribed species of Sulawesi fanged frog in which males guard clutches of eggs on leaves or mossy boulders that overhang slow moving streams and seeps. The Lesser Sunda Archipelago occurs as a double arc of islands extending between Java and Bali in the west and New Guinea in the east. This is one of the most geologically active and tectonically complex regions in the world. 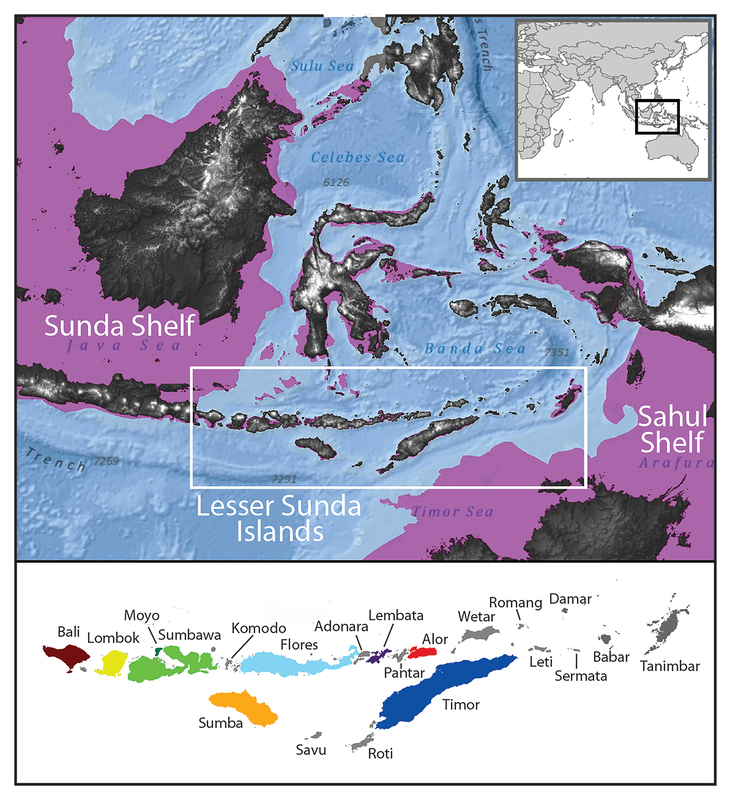 The Lesser Sundas may act as ‘stepping stones’ between the Sunda Shelf (Malay Peninsula, Borneo, Sumatra, Java, and Bali) and Sahul Shelf (New Guinea, Australia), thereby forming a two-way filter for organisms dispersing between two of the world’s great biogeographical realms, Asia and Australo-Papua. This study investigates speciation and biogeography of this region by applying phylogenetic and biogeographic methodologies, along with coalescent-based population genetic approaches. The study is comparative, investigating 12 amphibian and reptile species complexes. Novel to this program is the development of 200 nuclear loci for each focal taxon using a bait-capture approach that harnesses the power of Next-Gen DNA sequencing. Loci will be analyzed using phylogenetic and population genetic methods to evaluate broad biogeographic patterns across SE Asia, patterns of diversification thoughout the Lesser Sundas, gene flow at lineage boundaries, and to estimate divergence times for speciation events within the archipelago. Results will inform Indonesian agencies tasked with protecting areas of endemism in this Global Conservation hotspot. Update: We ultimately collected more than 3000 specimens sampled across 20 islands in the Lesser Sundas Archipelago. We collected mtDNA sequence data for ~1600 of these specimens representing 22 species or species complexes. We developed exome-capture arrays for 6 focal genera (Cyrtodactylus, Draco, Fejervarya, Lamprolepis, Limnonectes, and Sphenomorphus) representing a minimum of 11 species (not counting the many cryptic species identified via this work). For these focal taxa, we generated 1000-1200 locus data sets for phylogenetic and population genomic analyses. Image: A map of Southeast Asia illustrating the approximate extent of land areas during glacial maxima. A powerful way to study mechanisms that generate biodiversity is to focus on instances of convergent evolution. Convergent evolution occurs when the same trait evolves independently two or more times, providing natural replicates of adaptive evolution. For example, feeding on nectar and its accompanying morphological adaptations (e.g., long tapered bills with specialized tongue structures) have evolved independently in hummingbirds in North and South America, and in the sunbirds, spiderhunters, and flowerpeckers of Africa, Asia, and Australasia. This project will study these two groups of birds to better understand the ecological and genetic factors that lead to convergent evolution in associated genes and physiology. The research will investigate convergent evolution in the ability to taste sugar, metabolize alcohol, and live at high altitudes where there is less oxygen. It will also study convergence in the microbial communities living in the guts of the birds. This study will reveal how often the same genetic changes are responsible for the evolution of functionally similar physiological traits. This research will also lead to an improved understanding of adaptation and species diversification following: (1) shifts to a new diet, and (2) the colonization of high-altitude environments. The research will result in comprehensive evolutionary trees for hummingbirds, sunbirds, spiderhunters, and flowerpeckers, which will be an important resource for the conservation of these diverse avian groups that together constitute ~5% of bird species diversity. This project will train three graduate students and a postdoctoral fellow in research techniques integrating bioinformatics, functional physiology, behavioral ecology, genetics, and phylogenetics. It will also train up to ten undergraduates in sophisticated molecular genetic techniques and physiological research, which will give them valuable research experience. This grant will promote public understanding of science through a collaboration with educators who run the “Understanding Evolution” website, who will help to develop course materials for teachers that explain evolutionary concepts like adaptation and convergent evolution in the context of the diversification of hummingbirds and sunbirds. This project will study convergence in traits that improve hypoxia resistance, convergence in traits related to nectarivory, and will investigate how traits related to nectarivory may converge in high-altitude environments that characterize the diversification of hummingbirds and sunbirds. On the genetic level, the research team will study genes related to nectarivory (i.e., sugar taste receptors, alcohol metabolism genes) and gene pathways that can confer hypoxia resistance (i.e., hemoglobin, OXPHOS, and hypoxia-inducible factor pathways). In addition, the researchers will sequence 16S ribosomal RNA genes from gut samples of nectarivorous birds to study microbial communities. On the functional level, the research team will test how genetic changes have altered phenotypes important for both organismal function and subsequent diversification into new ecological niches. To accomplish this, the team will perform physiological tests to measure hypoxia resistance, quantify dietary alcohol exposure (in the form of fermented nectar) from feather samples, predict metabolic functions of gut microbes from their 16S rRNA sequences, assay functional differences among genetic variants in the lab (e.g., cell-culture assays that measure responsiveness of different taste receptor variants), and conduct behavioral tests of taste discrimination abilities. On the phylogenetic level, the research team will study the evolutionary history of genes and phenotypes to reveal instances of convergent evolution within and between the two avian radiations. Finally, the team will integrate all genetic, functional, and phylogenetic data to evaluate: (1) how the prevalence of convergent genetic evolution changes with time, and (2) how suites of traits co-evolve in response to high-altitude environments. Images: (1) Florisuga mellivora (White-necked Jacobin). (2) Our apparatus for field measurement of hypoxia-resistance in hummingbirds, including an air-tight plexiglass chamber, a FoxBox oxygen analyzer, and a tank of compressed nitrogen used to systematically replace oxygen in the chamber between hovering trials. This photo was taken in the Peruvian Andes by Chris Witt.